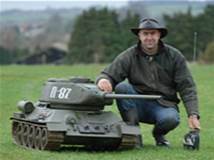 Mark 1 Tank has over 15 years’ experience supplying the ultimate in large scale radio controlled Tanks. We also supply Halftracks, Jeeps, Wheeled Armoured Cars and Amphibious military vehicles. Our reputation for supplying strong, tough and long lasting large scale military Models is second to none. The main tub, top and turret are made from high density fibreglass, up to 25mm thick on the larger scale models, giving un-rivalled strength, detail and durability along with being corrosion free. All moving mechanical parts [excluding smaller wheeled vehicles like the Willy’s Jeep] are made from metals, including tracks, wheels, sprockets, idlers, suspension, drive train bearings and axles. Rubber is used exclusively for all tyres whether applied to a Tank or wheeled vehicle and is also used for the track blocks where applicable on the modern tracks. Using Chain drive motors [from 250w on 1/8 scale, 350w on 1/6 scale and 500w on 1/4 scale] all our vehicles have more power than is required which makes them very efficient. Typically a 1/6 scale Tank, on level ground, going straight will only draw around 2 amps! Run times of over 3 hours are not uncommon. The time from order to completion is normally around 20 weeks although this can on occasions take longer. You will always be kept informed of progress and are welcome to contact Mark at any time to discuss. When all the parts are ready for the final assembly you will receive a daily photographic record of each days progress until completion. Once all parts of the specific Vehicle has been fitted and individually tested, we spend another period of time running the tank on our specially designed test track. We understand we have the only test track of this type in the UK. Mud, grass, water and several slopes to climb and descend to ensure each tank meets our very high quality standards. A full and detailed visual inspection is then carried out (and recorded) to ensure that no damage has occurred during the function testing. With the tank in its finished state, we drive it once again for a further half hour around our unique testing track specifically designed to make these fine working models meet our high quality standards. All batteries are then recharged and the tank is ready for collection or delivery as required. (Delivery prices are provided on application, please Email for details). We insist that all UK customers, when collecting their tank, drive them around our test track for as long as they require ensuring their total satisfaction. For first time RC operators, and even hardy professionals, we will provide as much advice as required to ensure you get the most out of being a Mark-1-Tank RC tank owner. You can contact us 24/7 by Email and we will always do our best to respond quickly and help all our customers enjoy our marvellous RC Vehicles. So far this has been reasonably unlimited unless blatantly misused or replacement due to wear and tear. This does not however mean forever!